Music is known to have a physical and psychological – and not just aesthetic and emotional – effect on us. But why is this so? This is one of the key questions in genetic and brain research on music. Music has an effect on the vast majority of people. Just listening to music is known to cause widespread activity in the brain, and actively practising music can shape the functioning and even the structures of the brain. The effects of music have been studied in brain research increasingly systematically since the 1990s. “The brain research on music undertaken in Finland is groundbreaking even in the international context,” says Professor Mari Tervaniemi, Head of the Brain and Music Team at the University of Helsinki. This network, formed by the University of Helsinki, the Helsinki and Uusimaa Hospital District (HUS), the University of Turku, Turku University Hospital and the University of Jyväskylä, specialises in brain research on music. The early stages of the research in the 1990s focused on how musical sounds are processed in the brains of healthy adult individuals. The measurable positive effects noted in brain scans inspired the researchers to study how music is used for instance in the treatment and rehabilitation of cerebral infarction patients. Today, the brain research on music undertaken in Finland focuses on ageing people with memory disorders and patients with brain damage on the one hand, and healthy children and adults actively engaged in music on the other. The effects of listening to music are also still being studied. Alongside brain research, genomics research on music got off to a flying start in the early 2000s. Finland is at the cutting edge in this field too, thanks to a multi-discipline research group formed by the Sibelius Academy, the University of Helsinki and Aalto University. Musical aptitude, music evolution and the effect of music on human beings can be empirically studied through genomics research. The studies published by the group have for the first time ever shown proof that musical aptitude is inherited and that listening to and performing music have an effect on human gene expression profiles. This reinforces the biological foundation of the findings of studies that model brain functions – for instance the findings that there are measurable differences in function and structure between the brains of musicians and non-musicians. Playing music is an almost incomprehensibly complex undertaking. It requires several senses working together, a feel for detail, fine motor precision, impeccable timing, learning, remembering and emotional input – all skills that are activated when making music. Engaging in music “exercises” the brain across a wide spectrum, and its by-product is the strengthening of other cognitive skills such as spatial or linguistic orientation. Making music also improves motor skills, observation skills and memory. In 2003 the Cognitive Brain Research Unit at the University of Helsinki embarked on an exceptionally lengthy monitoring study on the effect of music as a hobby on children’s brains. “We’re monitoring several groups of children who took up music at the age of seven. The oldest of them are in their twenties now,” says Mari Tervaniemi. “With such a long perspective, we can examine in detail how the learning of music shows up in the brain or, say, how having music as a hobby affects career choices. For me, this is the most fascinating study currently in progress at our unit,” she says. “Making music causes plastic changes in the brain, especially in areas of key importance for making music such as the auditory cortex, frontal lobe, motor cortex and the corpus callosum,” writes Mari Tervaniemi’s colleague Teppo Särkämö from the Cognitive Brain Research Unit at the University of Helsinki. Having music as a hobby would appear to support a child’s development in a number of areas. “Although this study concerns children and adolescents, taking up music in adulthood has very similar effects,” Tervaniemi points out. The findings in brain research on music confirm what early childhood music educators, teachers and music therapists know from practical experience: music has a healing effect. The benefits of music have been leveraged in treatment and therapy for a long time. Music therapy can help autistic patients express themselves better, bring down the blood pressure of coronary disease patients, improve the mood of depression patients, alleviate post-surgery pain; the list could go on. Many of the genes activated in playing music are the same as those activated in birds when they sing. Both brain research and practical experience indicate that music has positive effects, but the causes of this process and its biological background are still very little known. “Genetic research gives us direct access to the molecules that are at play in musical aptitude, in listening to music and when professional musicians perform,” says Docent Irma Järvelä, clinical teacher at the Department of Medical Genetics at the University of Helsinki. “By examining which molecules are activated and which are silenced by music, we can investigate the biological impacts of music. The findings will allow us to evaluate the therapeutic effects of music better than so far,” says Järvelä, explaining the practical goals of genetic research on music. Järvelä’s research team has performed two whole genome screens to locate regions and genes linked to musical aptitude in the human genome in Finnish families. The very first stage of the genetic study in 2003 gave indications that musical aptitude is a multifactorial trait determined by several genetic variants and environmental factors. The study was extended in 2011, and the findings remained the same. The genes responsible for inner ear development, auditory pathways and neurocognitive processes were found to be associated with musical aptitude. Both genetic inheritance and exposure to music affect the emergence of musical aptitude, a classic case of nature and nurture working in tandem. For a more detailed description of this study, see the article Homo musicus by Anu Ahola and Jaani Länsiö in FMQ 2::2014. Järvelä’s team has also performed a genome-wide screen of predisposing genes for musical creativity, a form of musical aptitude. The findings show that musical aptitude and musical creativity are present in people who are creative in other areas too. The next stage of the project involved finding out which genes are activated and which are silenced when the subjects listen to music and which genes react when the subjects make music themselves. A number of string players from the Tapiola Sinfonietta participated in the part of the study investigating the effect of playing music; blood samples were taken from them before and after a concert and analysed for changes in gene expression levels. The study revealed, for instance, that playing music activates genes associated with dopamine and iron metabolism, calcium balance, muscle movement, memory and learning. The dysfunction of these genes is known to cause Parkinson’s disease and certain psychiatric disorders and degenerative diseases of the brain. 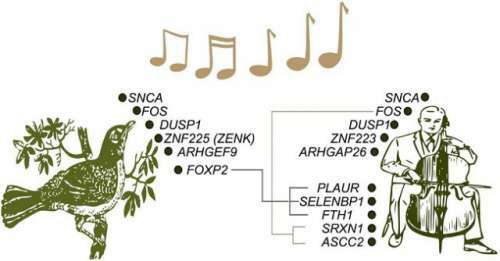 Moreover, many of the genes activated when subjects listened to music and when professional musicians played music are the same as those activated in birds when they sing, suggesting a shared evolutionary background between the vocalising of birds and the musical aptitude of humans. “At the moment, we’re exploring the effects of playing music by professional musicians and of listening to music on genetic regulation through microRNA studies. MicroRNAs are tiny molecules in the genome that regulate the function of genes. We know that about 60% of human genes are regulated by microRNAs. The purpose of the study is to increase our knowledge of the biological mechanisms at play in listening to music and performing music,” says Irma Järvelä. Uli Kontu-Korhonen sings and plays to a premature baby in neonatal intensive care. Tiina Laaksonen helps the baby turn its head towards the music. For musicians to visit therapy institutes and care facilities to conduct communal singing with the residents is not uncommon today, but in recent years a new use of music at treatment and care facilities has emerged. Music in healthcare settings is a genre all its own. Uli Kontu-Korhonen is one of its pioneers in Finland. Neonatal intensive care seems a strange sort of place for a musician to visit. However, premature babies reliant on ventilators benefit greatly from music, even those born several weeks early. “Studies show that music has a great impact on premature babies and the newly born in general,” says registered nurse Tiina Laaksonen from the neonatal intensive care ward K7 at Helsinki Children’s Hospital. “Music distracts the baby from unpleasant or painful sensations or fear or anxiety. When there is a pleasant sensory experience in the environment competing with the sensation of pain, the central nervous system latches on to the positive signal and damps the pain signals. This phenomenon is known as the gate control theory.” The impact of music is clearly visible in the readings of the devices that constantly monitor the vital signs of the infants. The babies sleep more deeply, their vital functions stabilise and their blood oxygen saturation rises when someone sings to them or plays music for them. Main photo by Katri Saarikivi: The brain research team investigates how this girl’s brain reacts to music while she’s concentrating on something else.